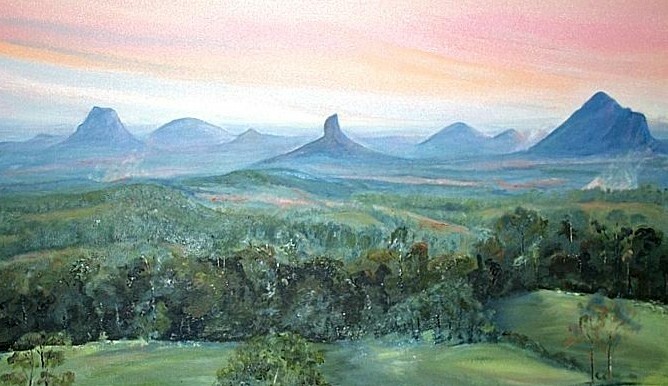 When, as children we used to travel to Caloundra for summer holidays, we would bypass the Glasshouse Mountains on the way up the Bruce Highway. In those days the highway used to be situated very close to these magnificent mountains, making them seem omnipresent and encouraging my childlike imagination to run wild. 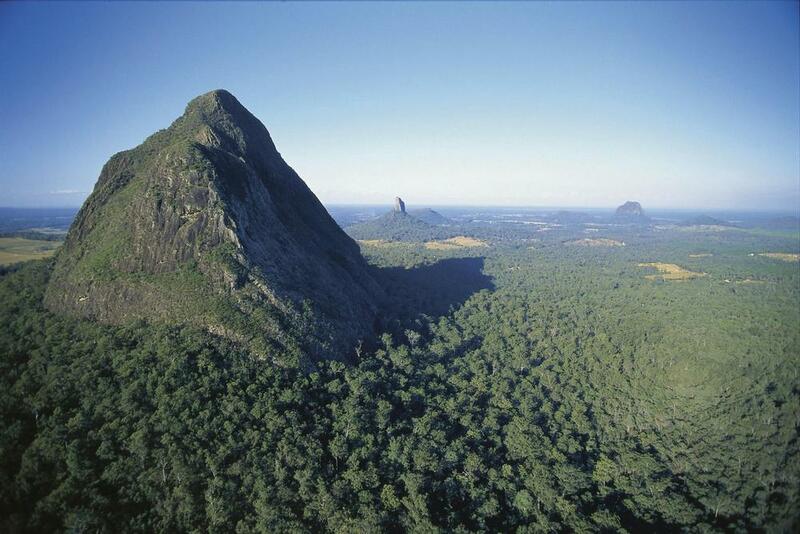 The Glasshouse Mountains were named by Captain Cook as he sailed past this region. The geological forms reminded Cook of the glass furnaces of his home in Yorkshire. The mountains also had great significance for the traditional owners of this region – the Gubbi Gubbi people. When I was a child there was a small tourist shop close to the mountains that had the story of the mountains on a small Gestetner printed brochure. The story tells of the mountains being a family, with the largest mountain, Mount Tibrogargan, being the father. My imaginary story was quite different as I saw Mount Tibrogargan as a King Kong gorilla figure, roaring across the forest and pineapple plantations. Many years ago, I walked up Wild Horse Mountain and I remember it was a beautiful walk with lush bush land covering the mountain and some magnificent views at the top. A number of other mountains are also popular with bushwalkers, so one day we might spend some time walking up Mount Tibrogargan to sit on King Kong’s shoulder. Absolutely beautiful. I’d never heard of this area of Australia before this. The first picture captivated me, it has such an ethereal feel about it. Thank you for the post. Understandable. It’s what life is all about creating memories.